It’s October, which can only mean two things: playoff baseball has returned to St. Louis and Metro is a great option for getting to all of the excitement in and around Busch Stadium without worrying about expensive parking and traffic jams before and after the games. 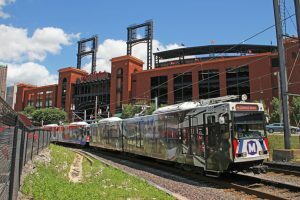 Metro will provide extra MetroLink service as needed for Games 1 and 2 of the NL Division Series on Friday, October 9, and Saturday, October 10, when the St. Louis Cardinals face off against the NL Wild Card winner — which will be decided on Wednesday when the Chicago Cubs take on the Pittsburgh Pirates. You can park at any one of 21 free Metro Park-Ride lots in Missouri and Illinois and ride MetroLink to the Stadium MetroLink Station right outside of Busch Stadium or to another nearby station to get to the games or other nearby festivities in downtown St. Louis. Metro will operate extra trains as necessary to accommodate the large crowds anticipated for Friday and Saturday, and additional security and staff will monitor MetroLink platforms and assist passengers before and after the games. Use our handy Trip Planner to plan your journey to the playoffs or contact Metro Transit Information at 314-231-2345 or 618-271-2345, Monday through Friday, 7:30 a.m. to 4:30 p.m for more information.